I thought it might be fun to get a poetic response and I wasn’t disappointed. There were some great efforts and I thoroughly enjoyed unpicking the clues from the verses people crafted in response. Of course, a poetic soul is only so much use in this game – you also need to work out what it is. It’s the Nine-banded Armadillo, Dasypus novemcinctus Linnaeus, 1758, a decidedly odd animal that lives in South, Central and southern parts of North America. 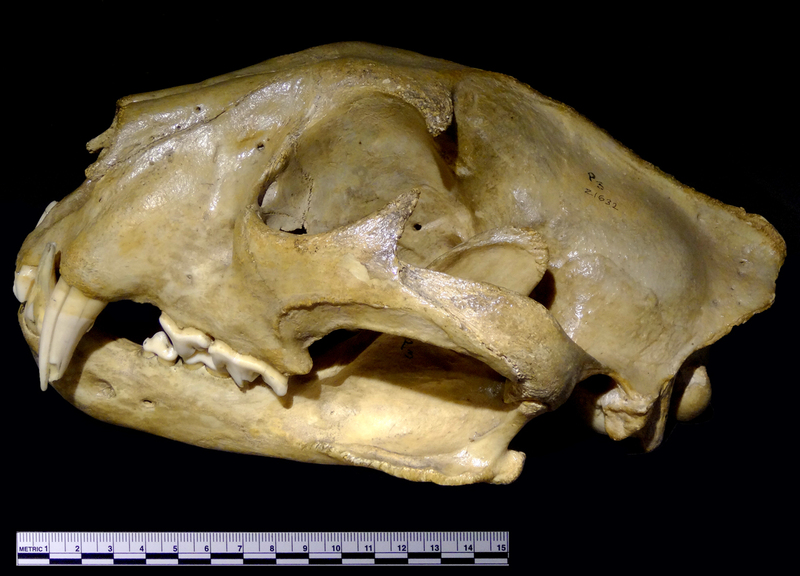 Most mammals have well differentiated teeth, so the homogeneity of these in shape (or homodont condition) suggested that you were dealing with something a bit unusual, with simple peg-like teeth, open roots and no enamel. That makes the mandible quite distinctive, even with some missing teeth. 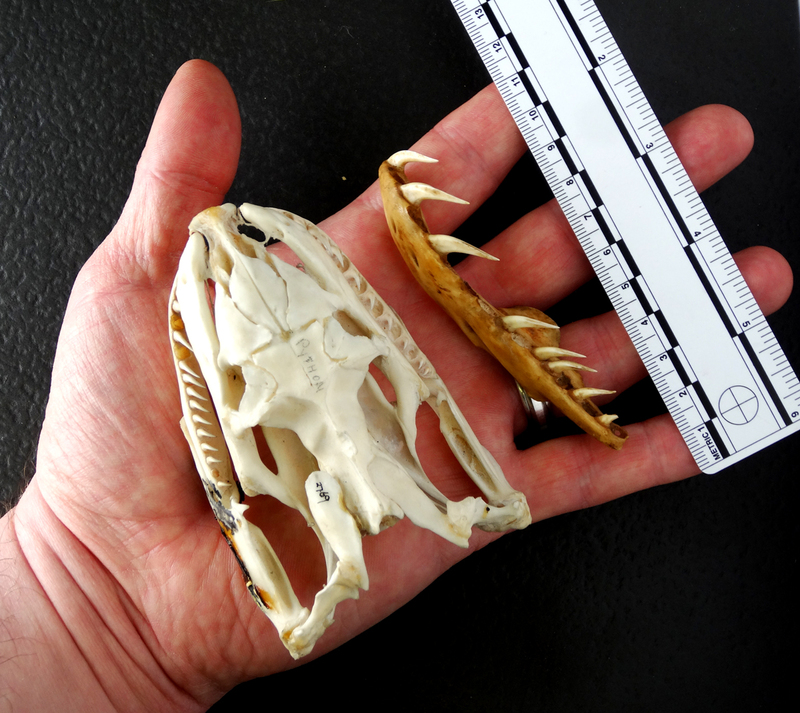 The one slightly confusing thing about this half a jaw is that it appears to have tooth holes (or dental alveoli) for 10 teeth (as recognised by salliereynolds, who also got the identification right), but armadillos are only meant to have eight teeth in each side of their upper and lower jaws. I thought this difference might throw you off the Armadillo scent a bit, but clearly I was wrong. The difference in this jaw will probably be because it comes from a young animal which still has milk teeth (or the alveoli for them) that aren’t all replaced by the adult teeth. They also consistently give birth to four offspring every time, originating from a single egg that splits into four. So every Nine-banded Armadillo has three identical siblings. I think this fact alone qualifies them as one of the weirder animals out there. *Juliette Kings may have got in with the first identification, with reference to the Armadillo’s habit of jumping straight up in the air when alarmed and occasionally screaming, but it sounded a bit more like she was suggesting Goat. Last week I broke the news that in October I’ll be taking on the role of curator at the Grant Museum of Zoology at UCL. Many thanks to everyone for their congratulations and kind comments – it’s wonderful to have so much support! I asked if you had any thoughts on what it might be, and you gave some great answers, mostly involving an ungulate canon bone or metacarpal / metatarsal. However, palaeosam and palfreyman1414 spotted that this isn’t made of bone, while Chris went one better by making a nice reference to ‘Horsing around near the river’ – a reference to the meaning of the name Hippopotamus. The key to identifying this is to look at the curve of the statue and the view from underneath. 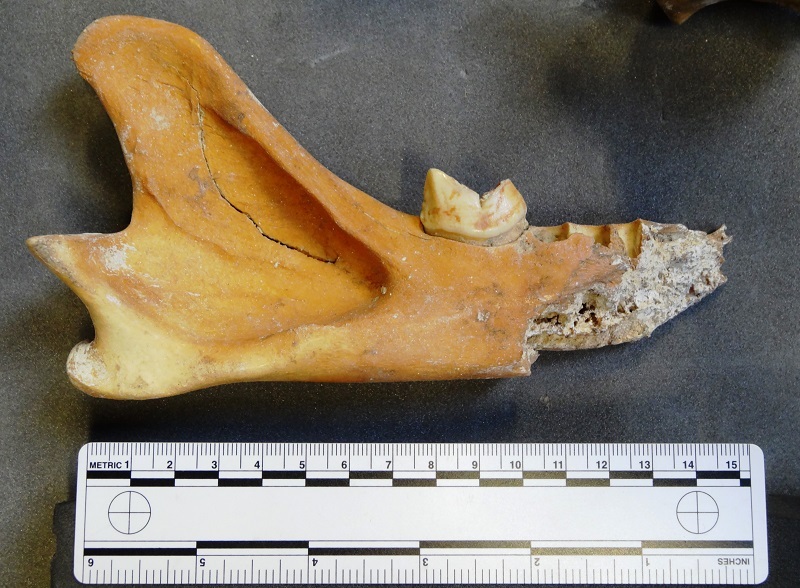 That cavity shape (plus the gentle curve) is exactly what you’d expect from the upper canine of Hippopotamus amphibius Linnaeus, 1758 – so well done Chris! There’s a helpful guide to identification of ivories by the US Fish & Wildlife Service, which is well worth a look to help with this sort of thing. Hopefully that’ll be a helpful resource for my colleagues at the Horniman in my absence… although they know where to find me if they need help in future! There were lots of great suggestions about what it might be, with most of you in the right area of the animal kingdom with a legless critter in mind. In particular a fairly primitive type, with aglyphous or ‘groove-less’ teeth (as opposed to snakes characterised by having opsithoglyphous or ‘backward grooved’, proteroglyphous or ‘forward grooved’ and solenglyphous or ‘pipe grooved’ teeth). 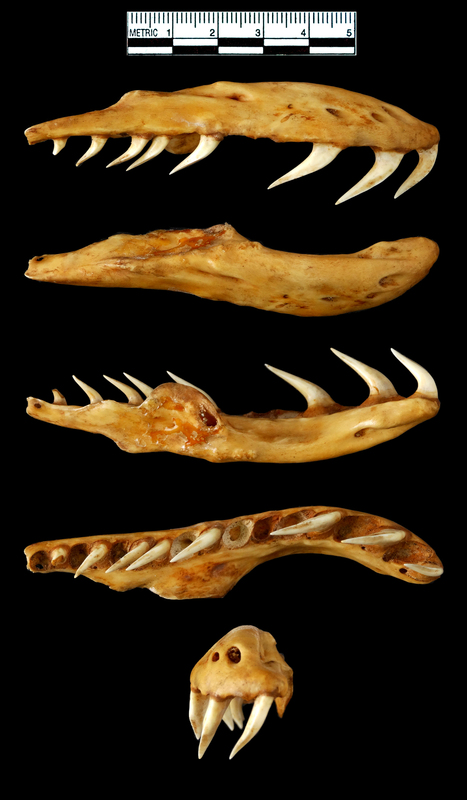 There were several suggestions of Boa constrictor – specifically the right maxilla (upper jaw), but they have a straighter top to the maxilla and a differently shaped process that connects with the frontal and ectopterygoid bones (check out Udo Savalli’s snake skull anatomy page to see what those terms mean). 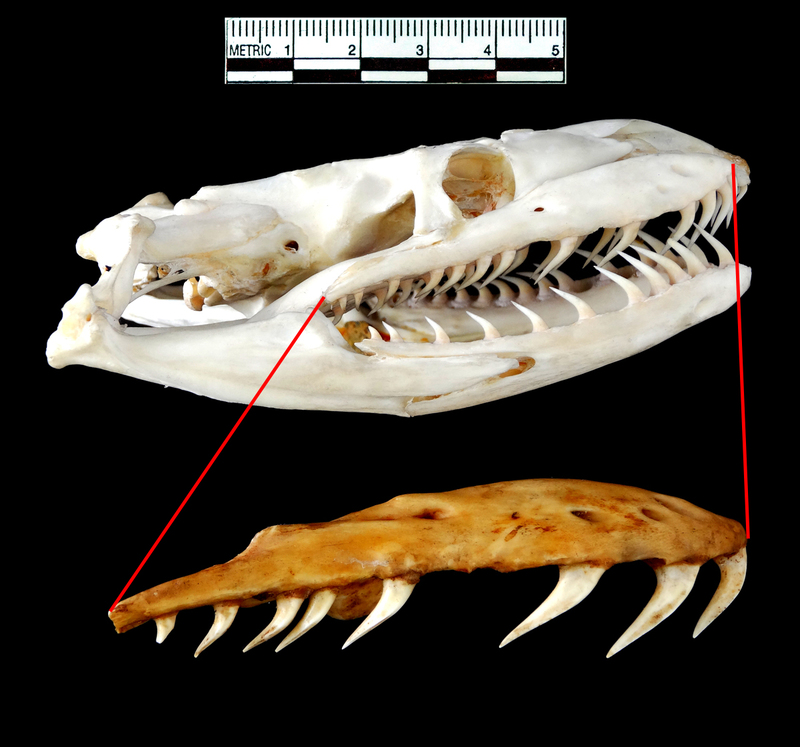 Anaconda was also suggested, but the anterior (front) part of the maxilla is not squared off enough. Nicola Newton, rachel and Alex Kleine all suggested Python, which is what I think it is. I’m not certain of the species, but it’s definitely a big one – I’m leaning towards the Reticulated Python Python reticulatus (Schneider, 1801). My very rough estimate of the length of the animal, based on other skeletal material I’ve seen, is around 5m – that’s one snake I wouldn’t want to get on the wrong side of! 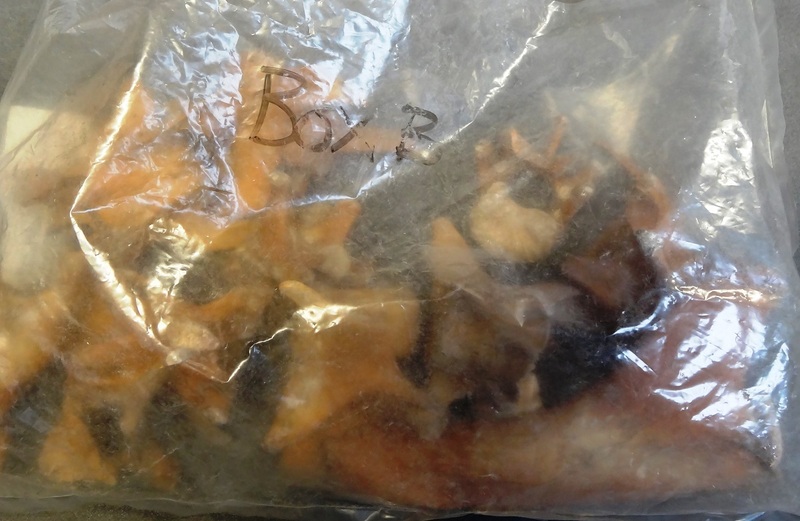 Any idea what species this fearsome looking row of teeth might have come from? You can put your thoughts, questions and suggestions below. Have fun working it out! I knew it would be a bit of an easy one, given the highly unusual teeth, but it seemed too interesting a specimen to not use. 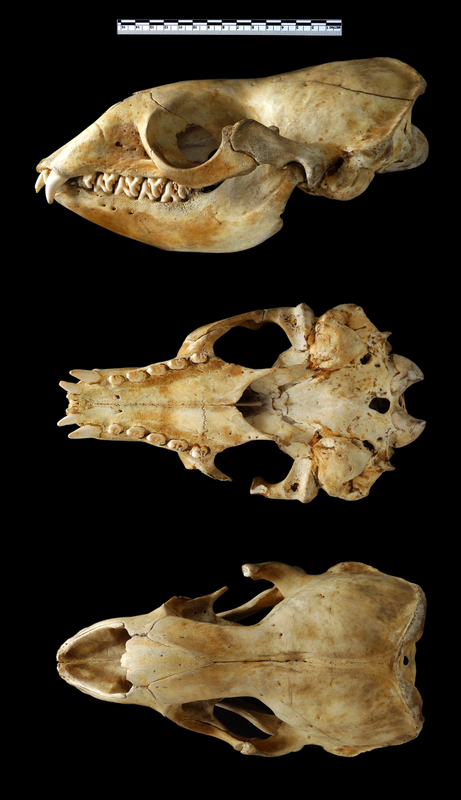 As cryptically suggested by many of you (Jamie Revell, Nigel Monaghan, henstridgesj, rachel, cromercrox, Robin Birrrdegg, Allen Hazen and Crispin), this is indeed the skull of a Crabeater Seal Lobodon carcinophaga (Hombron & Jacquinot, 1842). These seals are specialised for catching krill, hence the strange shape and tightly fitting nature of their teeth, which act as a filter to strain the tiny crustaceans from ocean water. Because these seals live in the waters all around the Antarctic, monitoring their population is particularly difficult, so estimates of their numbers vary considerably, from 2 million to 12 million (which is the more likely figure). 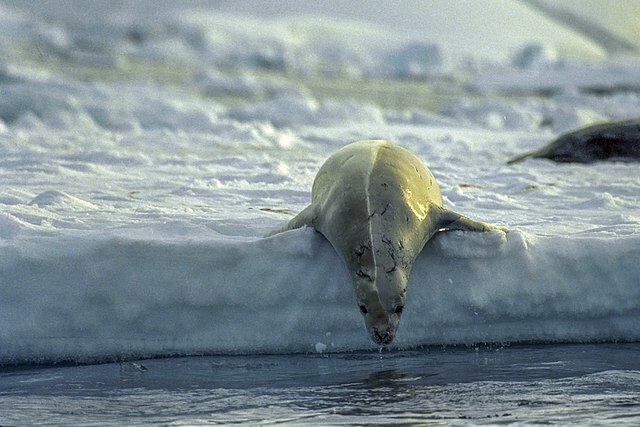 As with most abundant animals they have predators, in particular Leopard Seals. Apparently 78% of adult Crabeaters bear scars of Leopard Seal attacks, which can be seen clearly on the live individual in the image above. Most of the attacks happen before the Crabeaters reach a year old and get a bit too big to be easy prey, but in that first year there is apparently a huge mortality rate, with only 20% of seals making it to their first birthday. Good old Mother Nature is never one for sentiment. A very late and brief answer to the last mystery object I’m afraid – hopefully I’ll get back on track soon, once everything has calmed down a bit! It was a bit of a mean one, since these teeth are mostly broken with several missing. but there were some great answers. Several of you recognised these as teeth from a juvenile Old World primate, so well done to henstridgesj, Jake and Jakob Ramlau. Jakob also alluded to dogs in his answer and I wonder if he managed to spot that the primate was a Dog-faced Baboon Papio cynocephalus (Linnaeus, 1766) or Yellow Baboon as it’s also known. I’ll take some time to talk about deciduous teeth sometime soon, once I’m able to sit down and get back to blogging properly!